It can take developers a long time to set up a new server and prepare the appropriate environment when starting a new project. This can eat into the client’s budget and stop you achieving deadline as fast. Furthermore, all of that billable time setting up an environment is hard to explain to clients, because there is nothing to see and there is no progress with the coding until the whole environment is set up. Jelastic offers a fantastic solution to this problem. They streamline the whole process and make everything so much easier at every stage of the project development. This allows coders to make significant progress that much faster. Additionally, Jelastic allows easy management across all stages of the app development, ensuring time is maximized when setting up multiple instances of the app. You can switch between multiple instances of an application and manage the lifecycle in a more simple way. For example, you can switch between a dev app, test app and live app with the click of a button, making testing and project management a whole lot easier. Streamlining the lifecycle of development doesn’t end when the project goes live. There is always a worry that too much traffic could crash the server. Jelastic scales up and down automatically throughout the full lifecycle of your project. This means you no longer have to explain to clients about the change in load times and performance when there is a lot of traffic hitting the application. Now you can have peace of mind that Jelastic will scale up and load balance automatically, allowing programmers to focus on what they are good at – Coding! When a client is carrying out marketing activities, they can do so with ease, knowing that the website and apps can take whatever you throw at it. A project launch should be an exciting time for any company and also for the devs who have spent many hours of blood, sweat, and tears to create the application. However, this is often a very stressful time for many developers. When the project launches and people start to interact with the application, there can be emergency code fixes required. With Jelastic this is no longer an issue. Their load balancing and project lifecycle streamlining ensure that the app can be fully tested prior to pushing to the live site. The dev, live and testing applications can be easily managed through Jelastic, ensuring launch day is that much more exciting and successful. Sounds Great… But What Costs Are Involved? Jelastic has a flexible pay as you use pricing model. Resources are charged on hourly base: RAM and CPU (cloudlet resource unit), Disk space, External traffic, Public IP and SSL. Developers can track and optimize the billing within the dev panel. 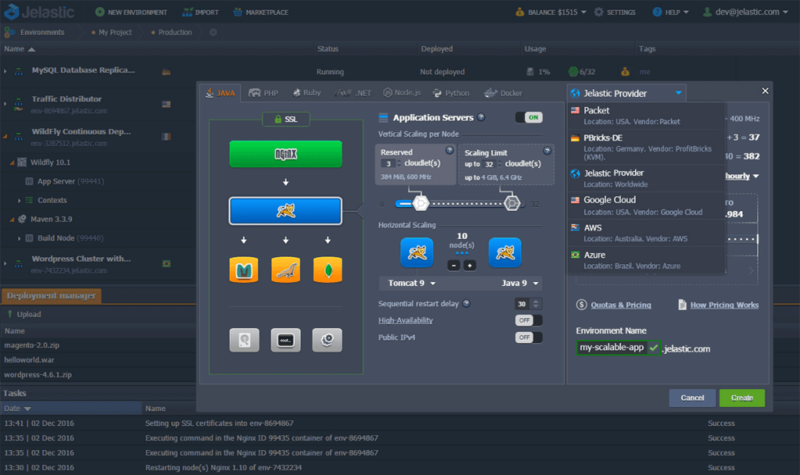 Jelastic PaaS saves developers time and money with cutting-edge tools, user-oriented pricing and drastically reduced need in the routine tasks. Sign up for a free trial at one of the available service providers.